Perched on the edge of Lake Champlain with a sweeping view of the Adirondack Mountains, the ECHO Center and Lake Aquarium examines the relationship between people and the health of the Lake Champlain region over time. 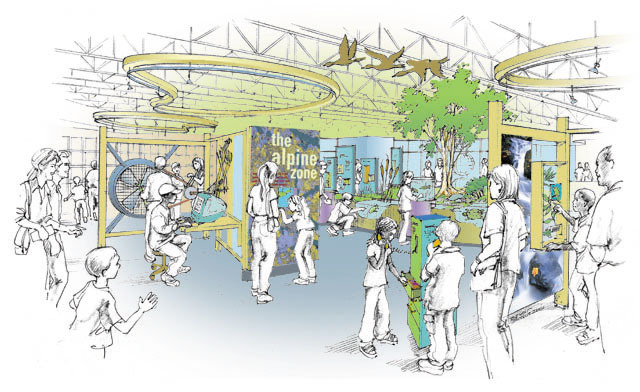 Working with Brent Johnson and Amaze Design, ObjectIDEA developed a “seriously fun” science center that offers encounters with live animals, interactive investigations, imaginative play spaces, and immersive multimedia experiences. The facility's name (an acronym for Environment, Culture, History and Opportunity) grew out the design goal to blend history and folklore, current scientific research, natural history, heritage tourism, and environmental stewardship.